Platinum sponsors of the Renaissance Cancer Foundation Gala present a check for $345,700, that will be used to help local patients who are diagnosed with cancer.From left to right: Jericka Gaskamp, DHR Health; Larry Safir, DHR Health Chief Strategic Officer; Elizabeth Jondreau, Interim Director, DHR Health Advanced Care Center; Natasha Del Barrio, CEO, Bert Ogden Auto Group; Robert Lucio, Executive Manager, Bert Ogden Auto Group; Edna De Saro, Senior VP and Marketing Director, Lone Star National Bank; Marissa Castañeda, Senior Executive VP and Chief Business Development Officer, DHR Health. 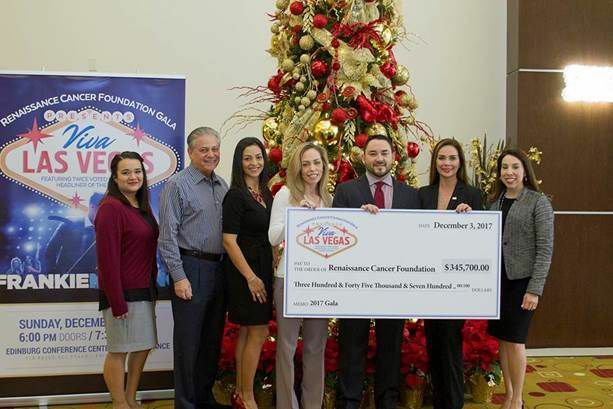 EDINBURG — Local cancer patients will continue to receive support from Doctors Hospital at Renaissance thanks to the nearly $350,000 they raised earlier this month, according to a news release issued Monday. At their annual gala held Dec. 3, the Renaissance Cancer Foundation raised $345,700 that will go towards local cancer patient care. The foundation is a non-profit that aims to provide support for cancer patients in the Rio Grande Valley. The nonprofit primarily focuses on funding chemotherapy treatment, medication, surgery, imaging studies as well as paying for house and utility bills, transportation, lodging, nutritional supplements, and hair loss items, according to information on the foundation’s website. This year, there will be approximately 1,688,780 new cancer cases and 600,920 cancer deaths which amounts to 4,630 new cases and 1,650 deaths per day, according to statistics from the American Cancer Society. In Texas, it is estimated there will be 116,200 new cases and 40,260 in 2017. The event was held at the Edinburg Conference Center and was sponsored by Lone Star National Bank, Bert Ogden, Love Your Cha Chas and DHR Health.